How would one do this? Blindfold the rattlesnakes, of course. The results were unexpected. Schraft had never actually seen a rattler before beginning his Ph.D. work with SDSU biologist Rulon Clark. Growing up north of Zurich, Switzerland, Schraft kept docile corn snakes as pets. Then, as an undergraduate at the University of Puerto Rico, he developed an interest in the evolutionary basis for animal behavior. It has long been known rattlesnakes can “see” the infrared (IR) portion of the electromagnetic spectrum. They have a specialized pit on their faces with a heat-sensitive membrane, allowing them to perceive thermal radiation. Their visual acuity also is quite high, believed to be on par with cats at night. In previous research, Schraft considered whether rattlesnakes use their IR abilities to zero in on cooler prey, which might be slower and easier to catch. For the new study, he wanted to determine whether rattlesnakes tap into this additional sensory channel for navigation at night, when visible light is low but IR contrast is very high. To answer this, Schraft had to come up with a way of blocking both the snakes’ vision and their IR abilities, both individually in some snakes and together in others, then observe the results and compare them to snakes without any impairments—a classic example of the scientific method. Schraft and three assistants, Elizabeth Signore, Tom Gantner and Chanont Alvord, set up a field station at a flat, sandy site at the Barry M. Goldwater Air Force Range in the desert outside Yuma, Arizona. Back at the field station, the team administered an anesthesia. The fumes take effect in 10 to 20 minutes, the snake goes limp, and the team can begin to block its senses. To blindfold the snakes, the researchers used a very small strip of black duct tape. To block the pit organ, they used a sphere of beeswax placed in the pit with tweezers and held in place with a drop of medical glue. For the experiment, some snakes got only one treatment or the other, some got both and a control group got neither. The snakes wake up quickly, but the team delayed release for a day to allow them time to adjust to sensory deprivation. The group then returned to the collection point and deposited the rattlesnakes in a 10 meter-wide arena set off by wooden stakes and black tarp and including four bladder sage bushes. The test would be to see whether the snakes moved toward the normally preferable, warmer bushes depending on which of their senses had been dulled. After hiding behind a sand dune for 10 minutes, the team returned to check the snakes’ tracks and see where they went. No snakes were harmed in the course of the research. Schraft’s methodology was approved by SDSU’s Institutional Animal Care and Use Committee. 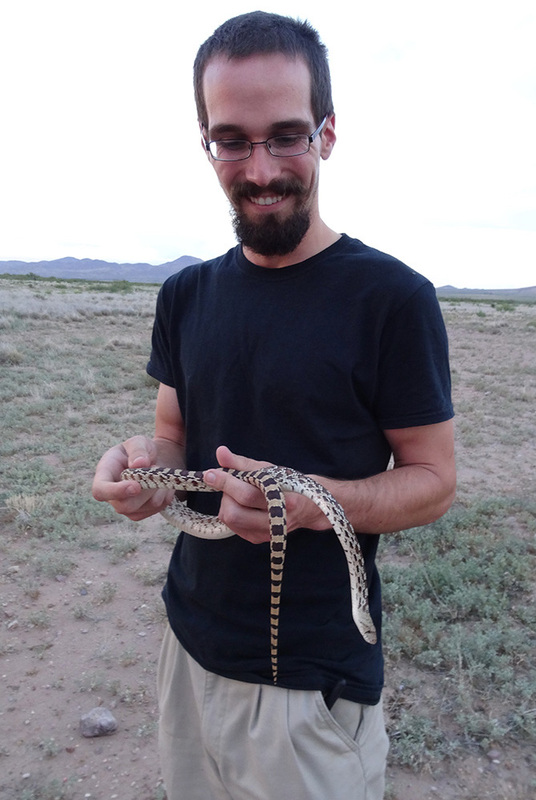 It was funded by SDSU, the San Diego chapter of The Explorers Club, the Chircahua Desert Museum in Rodeo, New Mexico, the Society for Integrative and Comparative Biology and the Herpetologists’ League. Findings were published in the January 2019 issue of the journal Animal Behaviour. The team used snakes living in the desert outside Yuma, Arizona.